HAWAII ISLAND - Governor David Ige’s request for a Presidential Disaster Declaration for Tropical Storm Olivia has been granted. 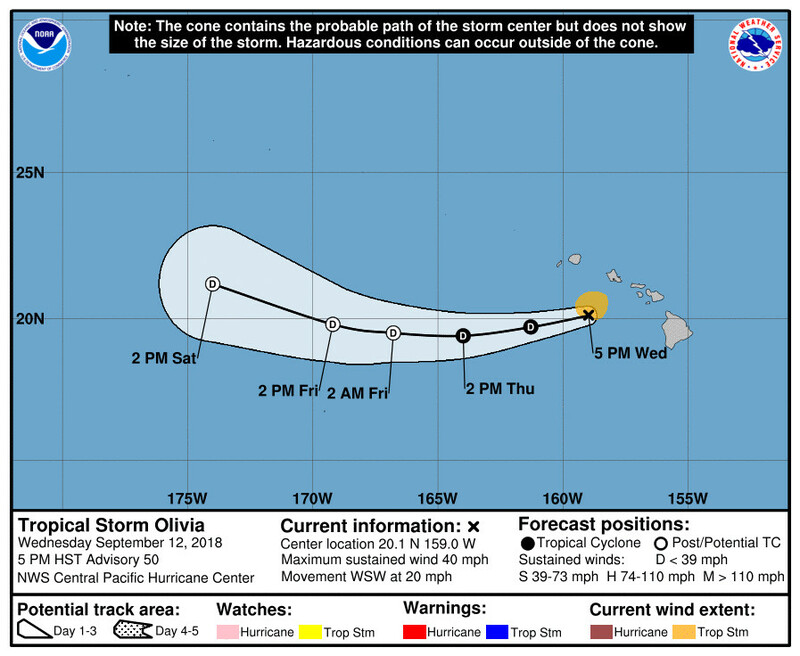 (BIVN) – The Tropical Storm Warning has been discontinued for Oahu and Maui County, as a weakening Olivia is moving away from the state toward the west-southwest. Maximum sustained winds are now near 40 mph (65 km/h) with higher gusts. According to the National Weather Service in Honolulu, Tropical Storm Olivia made landfall at 9:10 a.m. HST this morning along the windward coast of the West Maui Mountains, about 10 miles northwest of Kahului. 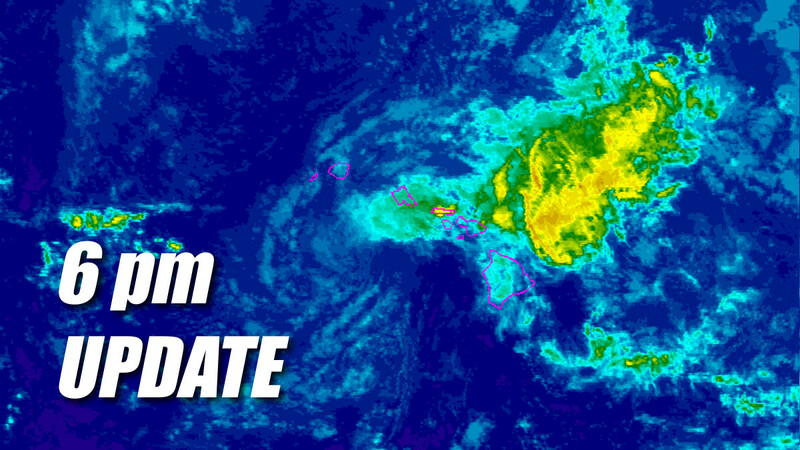 A second landfall occurred on the northwest coast of Lanai at 9:54 a.m HST. A Flash Flood Watch remains in effect for the Big Island, where the Tropical Storm Warning was discontinued this morning. “Although the tropical storm threat has passed, Hawaii Island remains under a Flash Flood Watch and isolated heavy rain and thunderstorms could still occur,” Hawaii County Civil Defense stated Wednesday morning in its final message regarding Olivia. Kamehameha Schools will reopen all campuses, preschools, community program sites and offices on Thursday, September 13, 2018. The Coast Guard Captain of the Port reopened commercial ports in Hawaii and Kauai Counties as of 9 a.m. Wednesday. All lands under the jurisdiction of the DLNR Division of Forestry and Wildlife (DOFAW) on Hawai’i Island have reopened and normal operations have resumed. The declaration authorizes the Department of Homeland Security, Federal Emergency Management Agency (FEMA) to provide appropriate assistance for required emergency measures in the effort to protect property and public health and safety, or to lessen or avert the threat of a catastrophe. In his request, Gov. Ige asked for direct federal support from Department of Defense assets for strategic airlift between the islands if needed; temporary power generation at evacuation centers; technical assistance related to points of distribution, and debris management action planning. In addition, the governor requested immediate access to federal resources for search and rescue, potential medical evacuations, mass care, sheltering commodities and additional temporary power generation capabilities. The state says the declaration covers Hawai‘i and Maui Counties, the City and County of Honolulu and Kaua‘i County.